Founders of All About Pies, Amy and Elaine, are sisters who grew up in a family of five kids on a farm north of Monroe, IA. Amy now lives in Newton, IA. She has two wonderful sons and is a proud grandmother to three granddaughters and three grandsons. Amy is retired from the Maytag Dairy Farms in Newton. Elaine still lives in rural Monroe with husband, Don, who is retired from Vermeer in Pella, Iowa. Elaine is retired. Elaine is very close with her daughter, twin sons and their families. Her pride & joy is her four grandsons and three granddaughters. 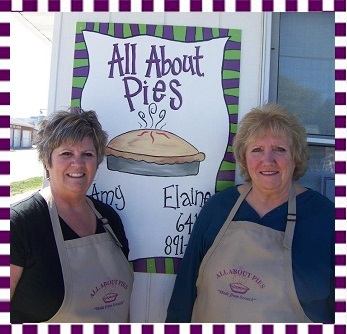 Elaine & Amy started making and selling pies several years ago with the help and support of their parents. It all began at a roadside stand on Elaine's property in the late summer. They started out just making a few to see how people liked them and, due to overwhelming popularity, their hobby turned into a business! After their dear father passed away in 2010 they decided to move ahead and find a different production location. They now make pies at 210 N. Monroe St. in Monroe, IA. Pies are available at their production kitchen, Monroe Foods in Monroe, at P.J. 's Deli in Newton, IA and Furniture Boutique in Knoxville . You can also stop by the Jersey Freeze in Monroe, PJ's Deli or Dan's Sandwich Shop in Newton, or Coffee Connection in Knoxville and enjoy a slice of freshly baked pie. Elaine & Amy cherish the nice people they've met over the years, customers from all over the U.S. and other countries, who come back year to year to buy a pie and renew friendships.